Inspired by Style Moderne, Milo Baughman designed the architectural Reynolds lounge chair in 1976. 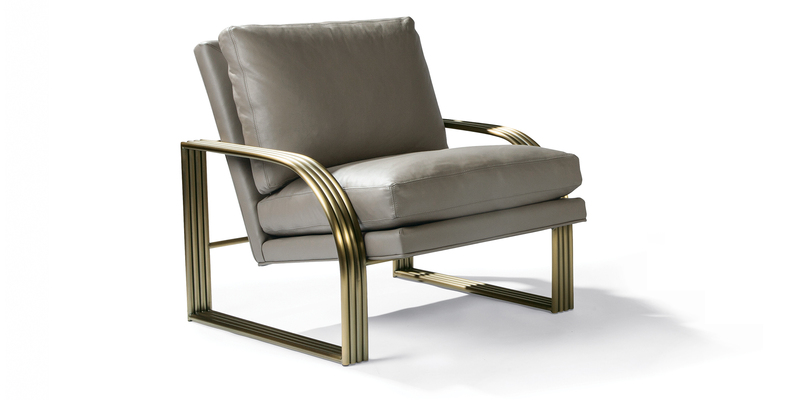 Reflecting Art Deco filtered through Baughman's modern classicism, our Reynolds lounge chair exhibits classic proportions and timeless beauty. Reynolds is now available with more options than ever, including polished stainless steel, brushed bronze or satin brass metal finishes. Seat cushions filled with poly blend down and backs filled with fiber and down fulfills the luxurious comfort of Baughman's humanist vision. Choose any of our in-house curated fabrics or leathers for upholstery or provide COM. W 31 | D 35 | H 32 in. Base and arms brushed bronze finish.